Publication year: 2005. xii and 414 pages with 1193 illustrations, of which 1142 in full color, and 12 tables. Hardbound. 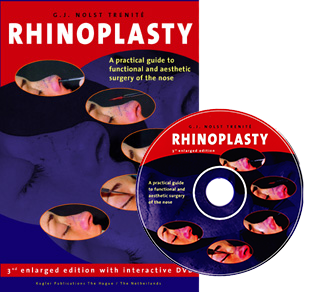 With interactive computer DVD (Windows and Mac compatible), containing the entire book and 4 hours of live surgery video. "Surgery of the external nasal valve: the correlation between subjective and objective measurements." Authors: Menger DJ, Swart KM, Nolst Trenité GJ, Georgalas C, Grolman W.
Clin Otolaryngol. 2014 Jun;39(3):150-5. doi: 10.1111/coa.12243. "Improvement of nasal breathing and patient satisfaction by the endonasal dilator Airmax®." Authors: Hellings PW, Nolst Trenité GJ. Rhinology. 2014 Mar;52(1):31-4. doi: 10.4193/Rhin. "Differences in cartilage-forming capacity of expanded human chondrocytes from ear and nose and their gene expression profiles." Authors: Hellingman CA, Verwiel ET, Slagt I, Koevoet W, Poublon RM, Nolst-Trenité GJ, Baatenburg de Jong RJ, Jahr H, van Osch GJ. Cell Transplant. 2011;20(6):925-40. doi: 10.3727/096368910X539119. Epub 2010 Nov 5. "Irradiated homologous rib grafts in nasal reconstruction." Authors: Menger DJ, Nolst Trenité GJ. Arch Facial Plast Surg. 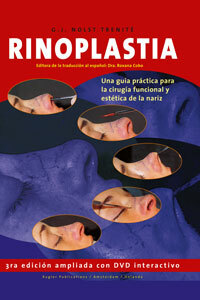 2010 Mar-Apr;12(2):114-8. doi: 10.1001/archfacial.2010.6. "Reconstruction of the nasal septum using polydioxanone plate." Authors: Boenisch M, Nolst Trenité GJ. Arch Facial Plast Surg. 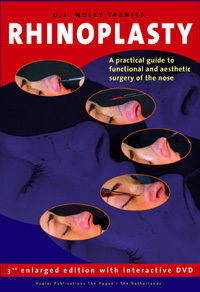 2010 Jan-Feb;12(1):4-10. doi: 10.1001/archfacial.2009.103.